So, despite the best efforts of the Rangers and Yankees, Cliff Lee is a Phillie. He'll receive $120 million over five years, which includes $12.5 million of a $27.5 million sixth-year vesting option. That's in the range of $8,000 per pitch if he remains healthy. If you're into whining about player salaries, there's your talking point. One of these players will not be part of the Texas rotation in 2011. How many wins above replacement (WAR) do the Phils need from Lee do justify that contract? Extrapolating from historical figures at Fangraphs, I estimate an average dollars-per-win during 2011-2015 of somewhere between $4.86 million(assuming tepid 10% league-wide salary growth in 2011 and 5% in subsequent years) to $5.62 million (a more robust 15% in 2011, 10% thereafter). Also assuming that the contract runs only five years, it necessitates between 21.3 and 24.6 WAR to pay off. (Since the dollars per win changes annually, the timing of Lee's wins affects his overall value, but to avoid undue complication I'm just using the average dollars per win over the five-year period.) Thus, Lee needs to average about 4.3-4.9 WAR per season after managing just under 7.0 during 2008-2010. What is the likelihood of Lee pitching that well? I first compiled a list of all starting pitchers with at least nine WAR in their Age 29-31 seasons during 1980-2010. There's nothing special about nine; three WAR per season just felt like a good cutoff. The age bracket matches Lee's last three seasons, and the date corresponds roughly to modern usage patterns. (I didn't want to compare Lee to someone who threw 420 innings in 1892.) I then summed each pitcher's WAR for the subsequent five years, which correspond to the length of Lee's contract. Pitchers who performed well in their Age 29-31 seasons but in the midst of that five-year follow-up (e.g., Halladay, Livan Hernandez) were excluded. 51 pitchers made the cut. Per Baseball-Reference.com *, Lee earned 16.6 WAR during his Age 29-31 seasons, which would place him sixth on this list and ahead of such luminaries as Curt Schilling and Roger Clemens. * Important caveat: I'm using Baseball Reference's WAR, not Fangraphs, for the remainder analysis. I hate switching, but BR's Play Index makes data compilation sooooooo much easier. I'm not going to make the mistake of combining BR's WAR with Fangraphs' dollars-per-win; rather, I'm focusing on a more general assessment of pitcher aging. Based on these comparisons, Lee's probability of continuing to pitch well is better than I expected. 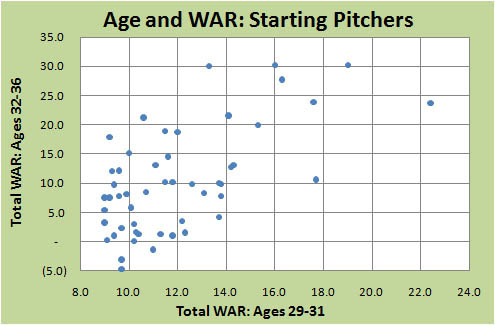 The pitchers below 14 WAR in their Age 29-31 seasons are all over the map. You have Kevin Brown, who finally realized his estimable potential in his mid-thirties. You also have swan dives from Doug Drabek and Jim Clancy. But among the elite pitchers, all with at least 14 WAR in their Age 29-31 seasons, the decline in quality is quite mild. Yes, Pedro Martinez collapsed after two seasons, and John Tudor was nothing special, but on the whole the best pitchers continued to dominate. The average pitcher in the below-14 group lost 58% of his annual value during the subsequent five years, while the above-14 group lost only 23%. Lee is part of the above-14 group. Again, the best pitchers acquit themselves pretty well. 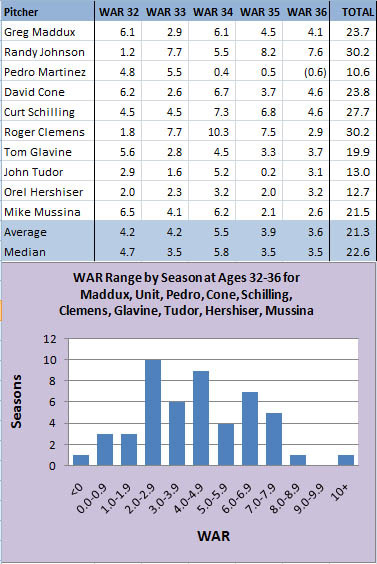 Of the 50 combined seasons, only seven are below two WAR, and five of those belong to Martinez and Tudor. Purely based on these comparisons, Lee can be expected to maintain his status among the better (if not best) pitchers in the game, and his contract, while among the lucrative in baseball history, isn't unconscionable. That said, the monetary upside for the Phillies is minimal. Also, this comparison depends on your willingness to include folks like Maddux and Clemens as Lee's peers. I'm just going where the data takes me. The annual dollars are only part of the equation. The real stickler for Texas was years. Reportedly, the Rangers balked at a guaranteed seventh year that would have landed Lee. They were right. Among the group of ten best pitchers, the average WAR declined to 2.9 in their Age 37 seasons and to 2.5 at Age 38 (only 2.3 and 1.8, respectively, if excluding an otherworldly Randy Johnson, who amassed 17.2 WAR during his Age 37-38 seasons). By their late thirties, some of the best pitchers of the last thirty years were essentially worthless. Guaranteeing over $20 million for a 38-year-old seven years in advance does little more than increase risk. Elvis Costello, "This Year's Girl," from This Year's Model, 1978.